(Phys.org)—Ever since the early days of quantum mechanics, the decay dynamics of unstable quantum systems has been thought to follow an exponential decay law, just like the one used to describe radioactive decay and many other natural processes. The exponential law in the quantum domain was originally proposed by George Gamow and later developed by Eugene Wigner and Victor Weisskopf. According to this law, when given a sample of unstable atoms, the number of those that are likely to decay during a brief period of time is proportional to the number of atoms present. In the years since then, however, physicists have found that deviations from the exponential law can occur in unstable quantum systems, but only in those that are isolated from the external environment. This is because isolated systems are free from environmental decoherence, which makes it possible for the quantum decay products to reconstruct themselves back into their initial, pre-decayed states. Consequently, the decay is initially slower than that predicted by the exponential law, and in the later stages, the decay often exhibits a power-law behavior. Researchers have previously shown that this nonexponential decay can be harnessed for quantum control. 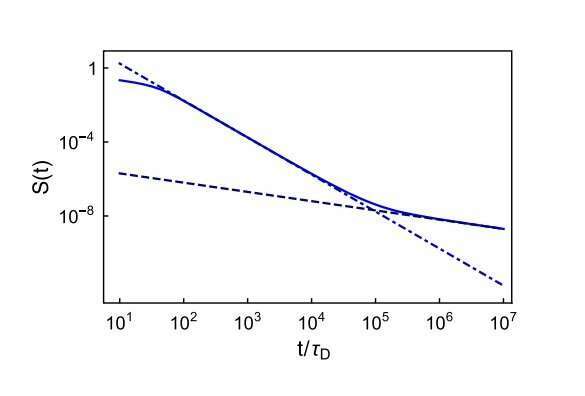 Now in a new study, physicists have theoretically shown that quantum decay processes can deviate from the exponential decay law not only when the system is isolated, but even when it is in contact with the external environment. The results suggest that an unstable quantum system can decay and subsequently return to its original state, even in the presence of environmental decoherence. The physicists, led by Adolfo del Campo at the University of Massachusetts, and including colleagues at the University of Basque Country and Aberystwyth University, have published a paper on the existence of nonexponential quantum decay in open systems in a recent issue of Physical Review Letters. "Previous studies have argued that deviations from the exponential law were absent in realistic 'open' quantum systems, due to their contact with the environment (anything in the surroundings)," del Campo told Phys.org. "Our work establishes the existence of nonexponential decay in open quantum systems, and we have demonstrated it in a paradigmatic setting, that of quantum Brownian motion." As the scientists showed, the quantum decay of a system characterized by quantum Brownian motion results from the contact of the system with thermal baths. They found that this decay is completely governed by deviations from the exponential law, and that it may be possible to observe this decay in the laboratory. The new findings also agree with experimental results from 2006, in which physicists observed that decaying luminescence in an open system violates the exponential decay law. In general, the new study shows that deviations from exponential decay in open quantum systems are present in many common instances of quantum decay. Overall, the results have potential implications for a wide range of areas. For instance, they are expected to lead to a better understanding of quantum decoherence and to help test theories that invoke the collapse of the quantum wave function. They also have applications for the "scrambling" of quantum information, as well as for quantum cosmology. "The dynamics of open quantum systems—which is any quantum system embedded in an environment—is of interest to a wide variety of fields ranging from quantum chemical dynamics to thermodynamics," del Campo said. "Our results apply to virtually any area dealing with open system dynamics. In foundations of physics, they govern the dynamical emergence of the classical behavior, the one that we perceive, from the underlying microscopic quantum world." The findings also suggest further research directions. "In as much as we take quantum theory as the fundamental description of Nature, the existence of return events to regenerate an initial state of a system is actually quite amusing and shocking," del Campo said. "And it is all the more so when such events happen with forgetful environments, with no memory. It does mean that it is possible for a system to return to its state in the far past during the course of its evolution. "In the spirit of sci-fi, if the same assumptions and mathematical description would hold in the macroscopic world, that system could be as complex as you and me. Yet, I do not think we should rely on that one. The exponential law already provides a wonderful approximation to describe the decay of systems as small as a radioactive atom. It is fair to say that the role of the complexity of the system remains to be clarified, making the study of quantum decay in many-particle systems an exciting area for further research." But by which mechanism is such a power law exacted? Many bodies self Zeno measurement, or acceleration preserving entanglement? Sets do not differentiation, but models with ground-states, and least action should. So very Poincare, yet there is no measuring tape here! A drunkard whose dimensions of bar and home seem to change, but relation will not be denied. Very interesting. It has long been the assumption that the power law was enforced by the correspondence of the classical to the quantum expectation. This turns out not to be the case. A relation very much like the Fluctuation Theorem appears to apply here, where the outcome is not actually what is predicted by the classical theory until a certain size or timing limit is reached. It will be interesting to see how this develops mathematically and exactly what the limit is, both in terms of what parameter(s) and their scale.